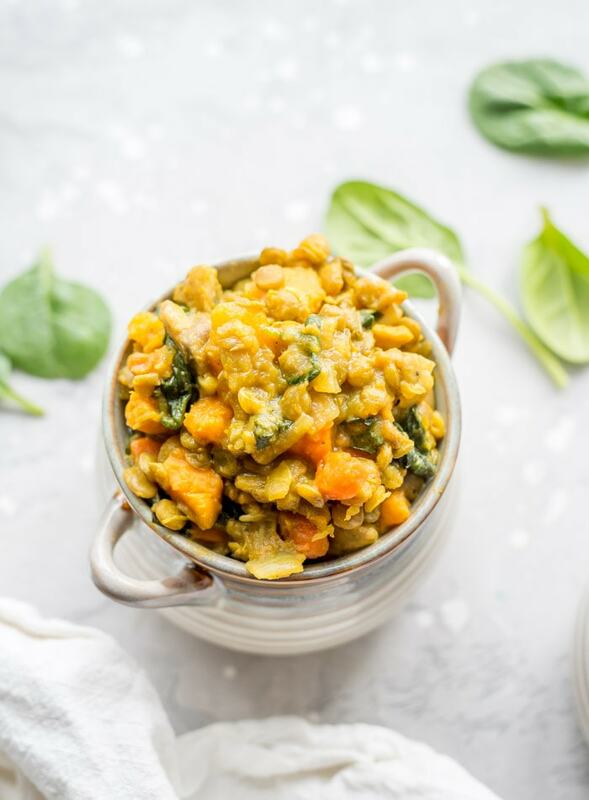 This curried butternut squash lentil stew is loaded up with all sorts of nourishing veggies. It’s got butternut squash, of course but you’ll also find carrots, sweet potato, onion, garlic, mushroom and spinach. 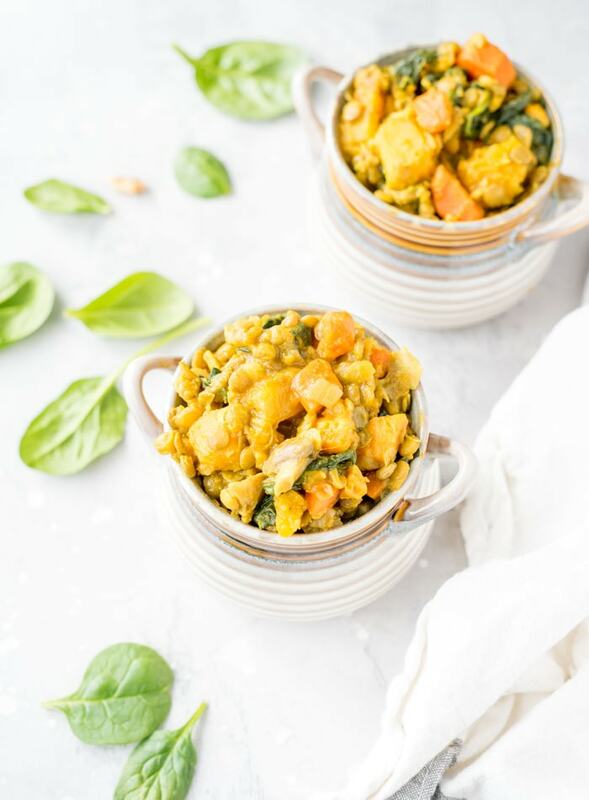 All these veggies create the most wonderfully creamy but textured and hearty dish, not to mention the wide range of nutrients you’ll find packed into this recipe. This recipe does not mess around nutrition-wise. 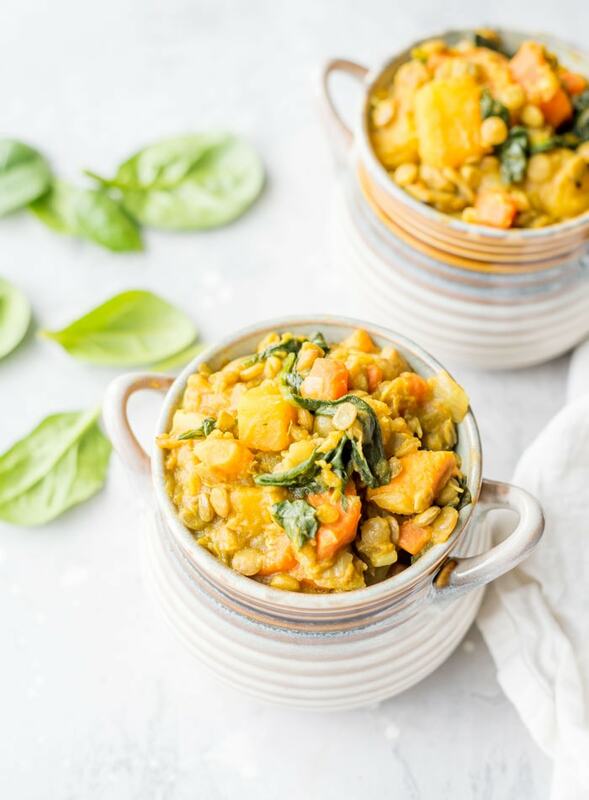 It’s virtually fat-free but very high in fibre and has a nice amount of plant-based protein plus energizing complex carbohydrates and a ton of micronutrients to keep you healthy all winter. 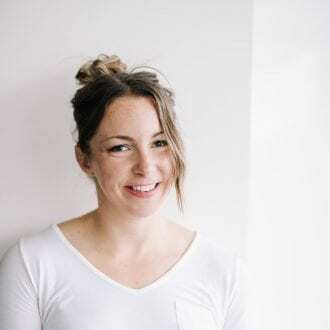 For one big serving, you’ll be getting 14 grams of plant-based protein, a whopping 19 grams of dietary fibre, 30% of your daily iron, 15% of your daily calcium, 66% of your daily vitamin C and more than your daily vitamin A. Bright orange butternut squash is an excelled source of carotenes and have been shown to exert a protective effect against many cancers, in particular lung caner. Diets rich in carotenes also appear to offer protection against developing type 2 diabetes. This beautiful, slightly sweet winter squash is also rich in vitamin C, folic acid, potassium, fibre, vitamin B6 and niacin. Lentils are up there as one of my most favourite foods. They’re an excellent source of cholesterol-lowering dietary fibre and help manage blood sugar levels since their high-fibre content prevents blood sugar levels from rising to rapidly after meals. In addition, one study found a significantly reduced rate or breast cancer in women who had a higher intake of beans and lentils. Eating beans two or more times per week was associated with a 24 percent reduction in breast cancer risk. I eat beans and lentils daily, if not a few time a day. You can’t beat them for folate, magnesium, manganese, iron, calcium, protein and fibre. They’re good stuff! 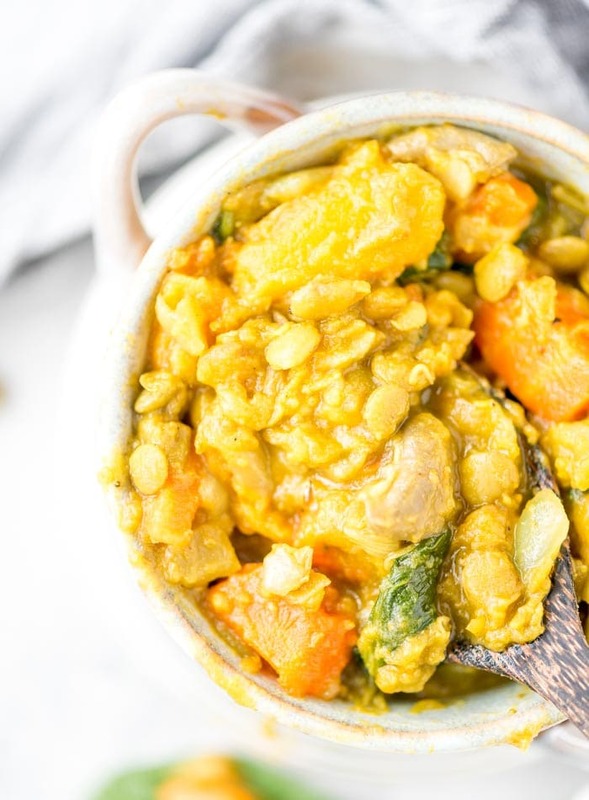 …and so much more….this stew also has antioxidant and phytonutrient-rich garlic, onion, sweet potato, carrot, turmeric and mushrooms. It just feels good eating it. Annnd it tastes amazing, that’s still important to me but I love thinking about all the good stuff in it too. This recipe is very easy to make in one pot. There’s a little bit of work up front to prep the butternut squash and chop veggies but once you’re done that and everything is cooking away, it’s a breeze. 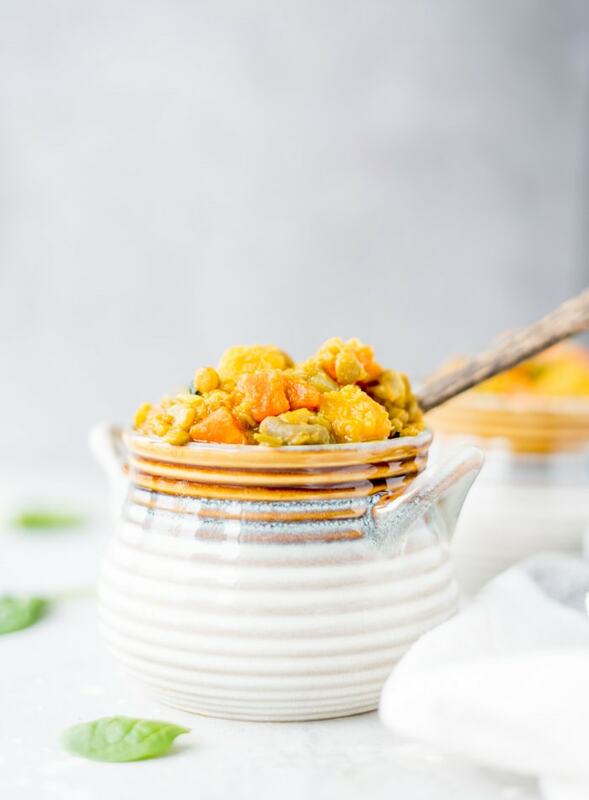 This stew has a delicious, slightly sweet, slightly spicy flavour and is extra thick and creamy as the butternut squash cooks to falling-apart-tender perfection. It keeps well in the fridge and tastes even better next day so it’s a good one for food prep if you want to make it ahead of time. If you’re in a pinch, you can make this with a 19 oz can of lentils. Reduce the simmering time to about 20 minutes, reduce the broth to 1 cup and just add the lentils when you mix the spinach in. 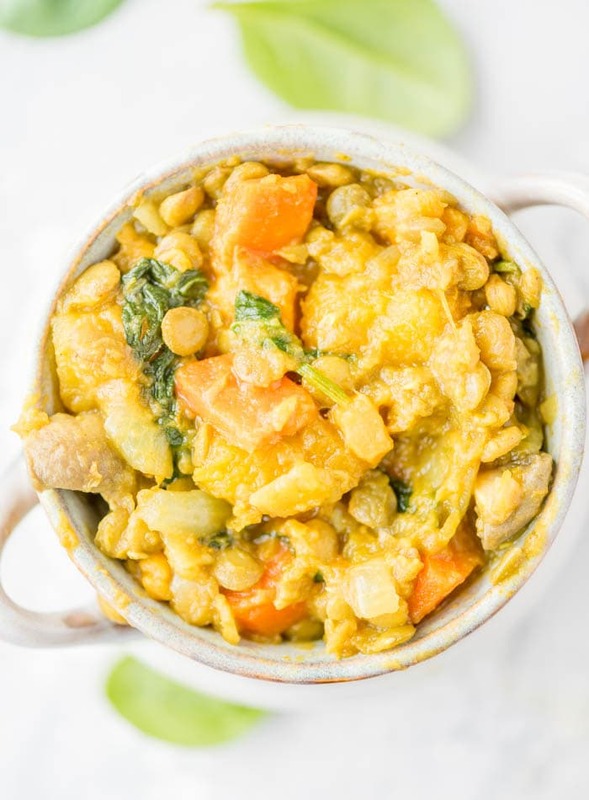 You could use red lentils too to reduce the cooking time as they don’t take quite as long to cook as green lentils. Add the garlic, onion and ginger to a pot and cook with a splash of water until starting to soften, about 5-10 minutes. Add water as needed if it’s starting to stick. Stir in the spices and cook for another minute or two. Add the squash, carrot, sweet potato, lentils and broth. Mix in the chopped mushrooms, cover and continue simmering for another 5 minutes. Mix in the spinach, cover and continue simmering for another 5 minutes. Take the lid off and turn off the heat. Season with salt and pepper, give it a good stir and let it sit another 5-10 minutes. Serve right away or let it cool and store in the fridge for up to 5 days. there is something about the union of onions, garlic, ginger, cumin & curry that elevates a dish. Thank you for sharing such an incredible dish! Yes, it’s such a good combo, isn’t it? So glad you enjoyed it! Thanks for the comment. I feel silly asking this, but I’m new to squash. Do you cook the squash before cubing it or no? Excited to try this! haha, no problem. For this recipe, no you don’t cook it before. Just peel, cube and add. Enjoy! This is probably a really stupid question, but does the recipe call for uncooked lentils?